Since Nashville has achieved "IT" city status, the hospitality industry has grown exponentially. Nashville has become a culinary melting pot with restaurant openings becoming a weekly occurrence, making it difficult for this food blogger to keep up. With all of the delicious new options, it's nice to revisit a classic from time to time. This week I visited an old friend, McCabe Pub. McCabe Pub is a family owned restaurant that has been serving the Nashville community since 1982. Serving anything from fried pickles to fresh trout, there's something for everyone on the menu and even if you can't find what you're looking for, I'm pretty sure they can make it! Many of the dishes prepared are long time family recipes that have been passed from generation to generation, so you know they are solid! The rainy weather really had us craving comfort food, so we decided to order the Open Faced Roast Beef Sandwich and the "Best Bacon Cheeseburger in Town." Open Faced Roast Beef Sandwich Served On White Bread With A Side Of Mashed Potatoes Topped With Gravy. Look At All Of That Cheesy Goodness! Without a doubt, we cleaned our plates. Wouldn't you? Look at all that cheesy goodness! Despite the fact that we were completely satisfied, we couldn't turn down dessert. McCabe Pub's desserts are made from scratch using age old family recipes. 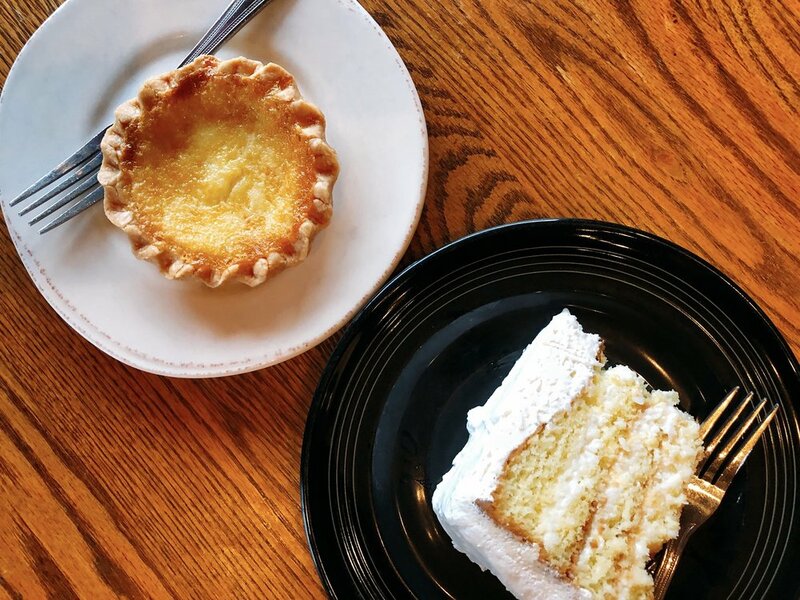 Having a weakness for coconut, I decided to order the Sour Cream Coconut Cake and my partner in dine opted for a Southern classic, Chess Pie. Both of these desserts were delicious. Even though I adore coconut cake, their Chess Pie was out of this world! If you are hitting up the golf course or wandering around the Sylvan Park neighborhood, mosey on over to McCabe Pub and grab a bite. In addition to their regular menu, they have a list of daily specials that are sure to make your mouth water! Thanks to McCabe Pub for partnering with me on this post! Daily Special Board- Be Sure To Check It Out!